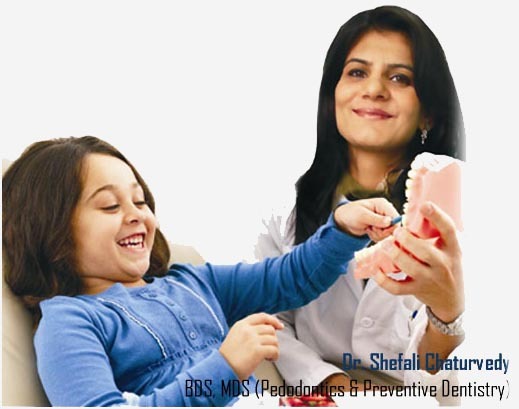 Dr shefali's commitment and motto is to provide your children the best dental care possible. Dr Shefali Chaturvedy has done her 3 year post graduate degree in Pedodontics and Preventive dentistry and exclusively treats the child patient. She is trained to work with kids from the age of six months to eighteen years. Her staff is well trained, kind and sensitive to the childs dental needs. Dr Shefali is friendly and make the patient feel special the moment they step into the practice. She understands the importance of establishing a good oral hygiene regimen early in a child’s life and provides the young children with the necessary knowledge and treatment to maintain a healthy smile. She is also trained to provide alternate treatment services such at nitrous oxide, intravenous sedation and hospital dentistry (full mouth rehabilitation under GA) in order to better serve nervous children and children with limited cooperative ability. For this purpose the clinic is attached with leading hospitals in Jaipur. Chaturvedy’s pediatric dental care, is beyond doubt the leading pediatric dental practice in jaipur under the able management of Dr shefali. The clinic is housed at c-scheme which is located in the heart of the city. It Is a well designed dental setup constructed along EuroAmerican lines and geared up with the latest equipment. The office design and equipment offers warm welcome to the patients. A bright and cheerful play area with toys, books and lcd tv keeps the children happily occupied as they wait for their turn. The child friendly pediatric operatory with fairy tale characters has been designed colourfully to make the children as comfortable and the environment less intimidating. Children get treatment done while watching TV and their positive behaviour is appreciated and reinforced when they are offered gifts from our tooth treat box.